Well, well, well! The kind folks at Steam Whistle have done a major contest on blogs blast, and RoundLetters is happy to participate. 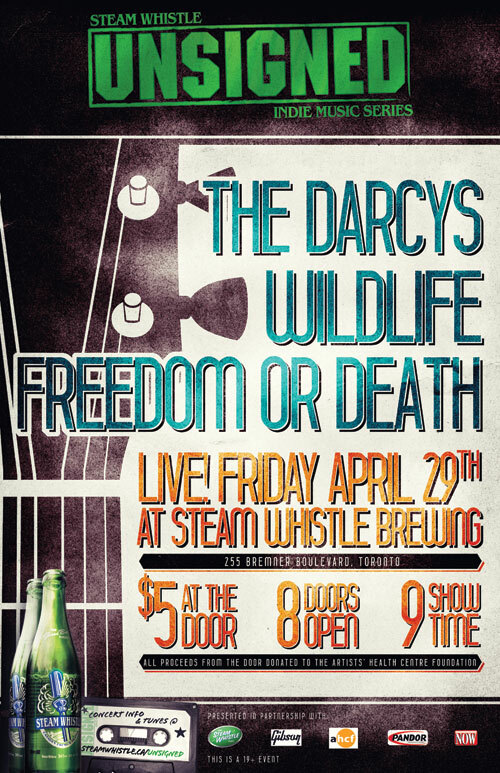 2 tickets to the Steam Whistle Unsigned show with The Darcys, Freedom or Death and Wildlife at the Steam Whistle Brewery in Toronto on April 29, 2011. PLUS a ‘swag bag’ of refreshment tickets, 2 passes for a brewery tour, a bottle opener, a t-shirt and an iPhone cover. SWAGGG. I will do a random draw that morning and contact the winner via email. You must be able to pick up your winnings at the Brewery before the 29th. This entry was posted in Contest, Toronto bands and tagged Canadian music, Concerts, Contest, Events, Freedom or Death, Music, News, Steam Whistle, The Darcys, Toronto concerts, Toronto contests, Upcoming concerts, Wildlife by Jessica Lewis. Bookmark the permalink.